Visiting the National Zoo in Washington, D.C. The 163-acre National Zoo, located inside Washington, D.C.'s Rock Creek National Park, is a prime attraction for families. With more than 400 animal species, the zoo is also a center for animal conservation, research, and education. The National Zoo is a part of the Smithsonian Institution and has been around for more than 125 years. Some of the favorite exhibits include Amazonia, Asia Trail (home of the Panda House), Great Cats, Elephant Trails, Primates, American Trail, Reptile Discovery Center, and Small Mammal House. The National Zoo is located north of downtown Washington, D.C. The main entrance to the National Zoo is along Connecticut Avenue. There are also two entrances at the east side of the zoo, near Rock Creek Park. One is off Rock Creek Parkway; the other is at the intersection of Harvard Street and Adams Mill Road. If you plan on traveling via public transit, get off at the Woodley Park or Cleveland Park metro stations. You can also take the bus from Dupont Circle. If you prefer to drive, you can park your car at the zoo for a fee, or you can usually find free street parking just a short walk away. The zoo is open every day of the year except December 25, when it closes for Christmas. There are extended hours from March 15 to September 30, with the grounds staying open between 8 a.m. and 7 p.m. while the exhibit buildings open from 9 a.m. to 6 p.m. In the colder months between October 1 and March 14, the grounds are only open until 5 p.m. and the exhibit buildings close at 4 p.m. The Amazonia exhibit opens at 10 a.m. year-round. Because the zoo is so large, it's smart to plan your trip before you go. You won't want to miss all the animals and exhibits on offer. It takes several hours to see all of the animals and exhibits at the National Zoo. Pick up a map and make sure to see your favorite animals first. The pandas, lions, giraffes, tigers, monkeys, and sea lions are among the most popular. To avoid crowds, arrive early in the morning or after 3 p.m. Weekdays are usually less crowded than weekends, and fall and winter are less crowded than spring and summer. Check out the zoo's daily program to see special events including animal training, feeding demonstrations, and zookeeper talks. Prepare for a lot of walking and dress accordingly. Wear comfortable shoes and check the weather ahead of time to see if you need to pack layers for the cold winter weather or extra water bottles in the hot summer. There are food stands with grab-and-go options as well as six on-site restaurants to choose from. Mane Grill is the main restaurant (open year-round). It serves Angus steak burgers, chicken shawarma, BBQ pulled pork, and more. In the Asia Trail area, there's Panda Overlook and Panda Grill. The former focuses on Asian-inspired plates such as noodles rice bowls, Thai coconut curry, and Korean BBQ beef while Panda Grill makes pizzas, meatball subs, and chicken tenders. Visitors are also allowed to bring their own snacks and drinks. Special events are hosted throughout the year by the National Zoo and its nonprofit partner, Friends of the National Zoo (FONZ). Easter Monday: For more than 100 years, families have visited the National Zoo on Easter Monday to socialize and celebrate the holiday by joining an egg hunt, listening to live music, and playing lawn games. ZooFari: ZooFari is a culinary event that includes gourmet food tastings, complimentary wine, cooking demonstrations, and a silent auction. 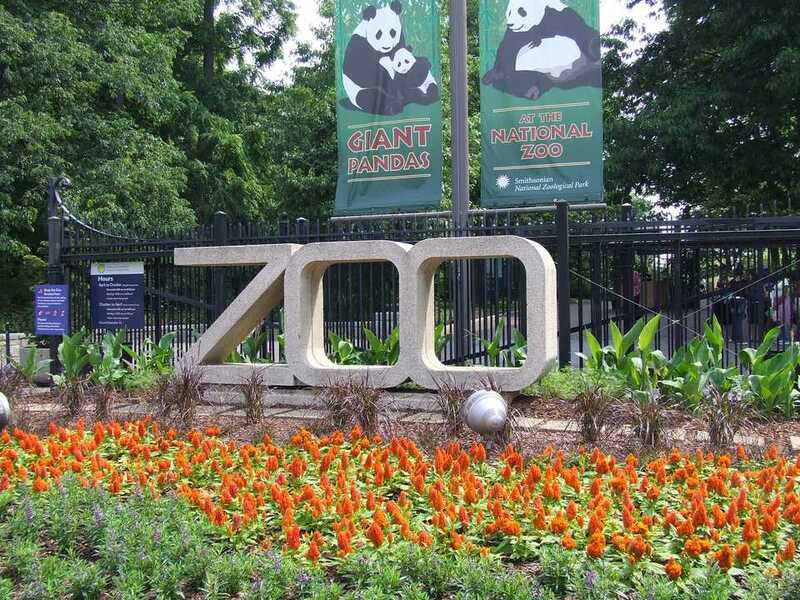 Proceeds benefit a variety of programs at the National Zoo, including conservation and science projects, exhibit development and construction, and the zoo's revitalization project. Brew at the Zoo: Enjoy unlimited craft beer tastings from more than 70 local breweries as well as live music and food truck fare. Conservation Discovery Day: This is the one time every year that Smithsonian Biology Conservation Institute in Front Royal, Virginia, is open to the public. There are panels with conservation biologists, field ecologists, research scientists, veterinarians, and animal keepers as well as biodiversity workshops and wildlife labs. Boo at the Zoo: This popular event lets families trick-or-treat throughout the zoo. Children can enjoy hands-on activities and interpretive talks about some of the zoo's creepiest creatures. Tickets often sell out fast so make sure to buy them in advance. ZooLights: Celebrate the holiday season at the National Zoo and see larger-than-life light displays featuring many of the zoo’s most popular animals. The Smithsonian Biology Conservation Institute is a 3,200-acre facility operated by the National Zoo. It is located in Front Royal, Virginia, and houses between 30 and 40 endangered species. Research facilities include a GIS lab, endocrine and gamete labs, veterinary clinic, radio tracking lab, 14 field stations, and biodiversity monitoring plots, as well as a conference center, dormitories, and education offices.